A lot of times, when I have reviewed a non-Marvel/DC book for Reviews, I have been shocked to discover the book I selected was published by Image. A lot of the books I have heard of and am just getting around to checking out have been Image titles, and I was unaware of that going in. In the same way that people in my age bracket still think the 90’s was less than ten years ago or so, I still tend to think of Image comics as “Spawn, Shadowhawk, Savage Dragon, Pitt, Youngblood, and CyberForce”. I do recognize that Invincible is part of that universe, but even then, he’s the “new guy” in my head. Even though that book is running around 150 issues or so, right? Thinking about Image Comics—and the O.G. Image Comics in particular—gave me an inspiration. What have I never yet reviewed? Why, only my single favorite comic series of all time! Protagonists: Dragon, the Chicago PD, Freak Force, so, so many others. Antagonists: Overlord, Cyberface, Darklord, Brainiape, and EVEN MORE others. I wonder if this still holds up as my favorite comic series of all time? Others have certainly come along to challenge its spot. Ultimate Spider-Man. Geoff Johns’ run of The Flash. Joss Whedon’s tenure on Astonishing X-Men. But man, I really and wholly loved this series for a long time. This would be one of those “I have to read these all back-to-back” situations which, as far as self-inflicted torture goes, is a pretty good one. Dragon was THE Image book for me when the company made its triumphant debut back in the early 90’s. I was a huge fan of Larsen’s work on Amazing Spider-Man and Spider-Man (with his shamelessly fun and over-the-top “Revenge of the Sinister Six” storyline being the epitome of empty calorie comic goodness), so I was eager to see what he could do on his own. Even from early on, Savage Dragon seemed different than the other Image books in the way Larsen talked about his creation. While a lot of the rest of the initial offerings feeling like knock-offs or money grabs, Dragon was always portrayed by Larsen as his favorite childhood creation, and he stated early on that is goal was to match or beat Dave Sim’s run on Cerebus for 300 issues, all written and penciled by one man. At this point, Erik is well over 200 issues in, so he’s been true to his word. Dragon was not a quick capitalization on the buzz around Image; it was Larsen fulfilling his dream project. I’ll start with the only real knocks I have on Savage Dragon, and that’s that Erik is apparently a huge fan of just big ol’ walls of exposition. Whether it is in the form of narration boxes or characters monologuing, there are a lot of pages that are just chock full of words with someone explaining the plot or recent goings-on to you. If you accept this is just old school storytelling, and the idea is that it catches the reader up if they have missed an issue or two and are reading in real time, month-by-month, then it’s fine for what it is. But when you binge read the book, it feels wildly repetitive and unnecessary. That, and it’s not really my preference in comics. But, like I said, even as a flaw, I see why it is done that way. The other problem, so much as it is, is that Erik Larsen is a strongly opinionated guy who has a lot of axes to grind. Due to this, we get thinly-veiled shots at Peter David and John Byrne with some frequency, and the letters page (if reading those is even your thing) can occasionally turn into drawn-out, tedious affairs of Erik lambasting his foes. It’s fine; it doesn’t detract from the work. It just feels a bit silly at times when just want to enjoy your funny book. And all these years later, they are even more dated. As for what’s good about the title, the first thing that comes to mind is rock solid long-form storytelling. From the word “go”, Larsen had an entire universe in his head that’d been cultivating since his youth, so he always had a pretty steady grip on where things would progress. Due to that, he can set up things that won’t pay off for sometimes dozens of issues. There are moments where you will read something, it will tickle something in the back of your brain, and you’ll re-read a book thirty issues prior and go “Oh! That makes sense!”. It’s deliberate storytelling at it’s peak, and it’s indicative of how much Larsen loves and plots these characters and stories. 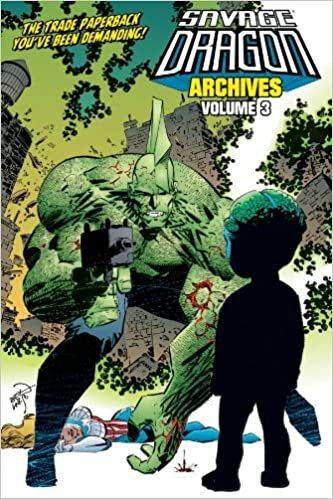 If you are a fan of Walt Simonson or Jack Kirby, you’ll quickly pick up on the homages and references to their works in Savage Dragon, and Larsen never hid the fact that he was largely influenced by their process. It never feels derivative because the spins on classic characters and themes in Savage Dragon are so complete that they have their own souls. It’s just some quality creation that harkens you to other quality projects you’ve likely enjoyed. 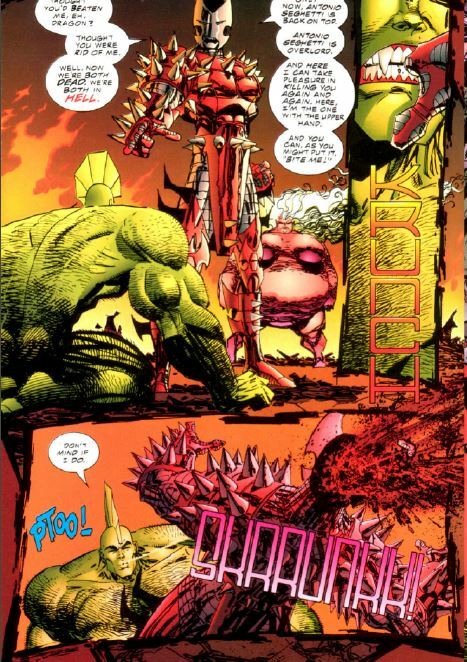 Another consistent aspect of Savage Dragon is Larsen’s willingness to take risks. Especially as the series wore on into the eighties (issues, not the decade, obviously), he was increasingly willing to screw around with the narrative format, the way characters speak, and even his own artistic style. Out of the blue at one point, he starts drawing some female characters like Little Orphan Annie (with black dots for eyes), and… I guess why not? It’s his book; he’s earned the right to play with it. As a reader, it keeps you on your toes and lets you know that this isn’t a book that is willing to rest on its laurels. Hell, to that end, the book ages in real time, and the title currently stars the child that Dragon had back in the 90’s as the core protagonist. Talking Point: This is going to seem like a weird one, but bear with me: What single issue of any comic book were you the most excited to buy when you got your hands on it? The reason I ask is that I had missed Savage Dragon #53 when it was released, and it took me literal YEARS to eventually find it. It was the glaring hole in my first hundred+ issues for a while, and filling it was a nigh euphoric experience. I won’t give it a ten because I’m basically referring to the book as a whole creation and not a single arc. That said, it’s not a flawless work, but it’s still damn fun, well-crafted, and worth a read to anyone that likes action-packed funny books with engaging characters. It was my favorite individual book for years, and I still enjoy it bunches. Want more info on this series? review in this archived podcast episode.